Freemasons For Dummies: "Gentlemen 101"
It's curious that this story popped up on my Facebook feed today. It's a tale about an elementary school in Charleston, South Carolina that has a program for 1st through 5th grade boys who, once a week, are dressed in their Sunday best outfits, and meet as a 'Gentleman's Club' to learn the basic life lessons of how to be a well mannered man. It's been so successful that the idea is spreading to other area schools. Every Wednesday nearly 60 students at Memminger Elementary dress for success and meet for the Gentleman’s Club. Raymond Nelson is the student support specialist at Memminger Elementary in Downtown Charleston. He works with at-risk children and over winter break thought of an idea to teach his students life lessons. Nelson started The Gentleman’s Club. 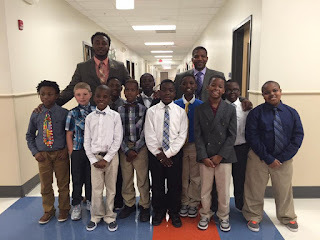 Their motto is “Look good, feel good, do good.”Every Wednesday, dozens of first through fifth graders walk into class in their Sunday’s best. “They like the reaction of walking up to classrooms and say, ‘Oh, you look so nice and handsome,’ they just love it,” Nelson said. Nelson keeps a stash of donated jackets, vests and ties at school for kids who don’t have their own. “A lot of my students perform well when they know someone cares about them,” Nelson said. Each week they discuss a new topic like how to shake hands, make eye contact, open doors and address their elders. Nelson says because some of the younger boys are still at the age where they consider girls to have cooties, he bases his lessons and examples off how they would treat sisters, mothers and their teachers. “I know a lot of them struggle because a lot of them don’t have men at home, so I just want them to grow up and think of the things that I teach them,” Nelson said. At his mother’s request, Nelson himself joined a similar group as a child. “It helped me to be a better man and I could spread the knowledge to the young boys,” Nelson said. The Gentleman’s club has been so successful at Memminger that Charleston County School District officials say they want other local schools to begin Gentleman’s programs in their schools. The reason I say that this is curious is because earlier this week when I was at the Conference of Grand Masters, I was speaking to the Grand Master of Wisconsin, Frank Struble. He told me that he has spent the last few months visiting around his state, conducting what he calls a Listening Tour, and collecting various ideas that have worked to revitalize local lodges. These have been published in the 2016 Wisconsin Masonic Journal issues. One idea that he was especially intrigued by came from a lodge that started a program they call "Gentlemen 101", and it's not too dissimilar in concept to the program described in the Charleston story. The lodge donates tuxedos for young men in area high schools for them to wear to their proms, and they provide regular gatherings at the lodge to teach these young men manners, dressing and grooming tips, and other life lessons in how to be a gentleman. Frank said an upcoming issue of the state magazine will have a feature article about the lodge program, and I will update this post when it comes out. Brother Cody Jones' wife is in charge of a program at her library called "Project Prom" where they collect both formal dresses and menswear to donate to families in need so that their kids can still have the prom experience that otherwise they would not be able to afford. They are very much in need of gently-used suits and tuxedos. If any of you have formalwear that have cycled out of your wardrobe and you would like to donate it, please send a message to me and I will pass it along. If you live near Franklin, you can drop items off at any of the four Johnson County Public Library branches (the Franklin Branch is right next to the Indiana Masonic Home). Mention to the folks there that it is for "Project Prom" and they will get it to the proper hands.